My perfume goddesses, Gwen and Kay of perfumeniche.com, are sympathetic (to a point) about my eternal search for a satisfying, if not fabulous, budget fragrance. I can't argue with the you-get-what-you-pay for principle, though I find some designer products egregiously overpriced. As the days shorten and chill, my fragrance mood shifts. A few drops really do act as therapy. Kay's latest list suits all hemispheres. All suggestions below are available as decants at Gwen and Kay's perfumeniche.com site. I haven't listed full bottle price because of variation among vendors, but none of these are pricey. Maybe for the next fragrance post I'll give them an unlimited budget, which kind of scares me. Vetiver by Guerlain: "Green, grassy and fresh"
Encre Noir by Lalique: "Vetiver, licorice and woods"
Tocade by Rochas: "Rose and vanilla"
Omnia by Bulgari: "Spices, tea and sandalwood"
Diva by Ungaro: "Spices, rose, honey, moss"
Aromatics Elixir by Clinique: "Floral, leather, woods, moss"
Sensuous by Estée Lauder: "White floral, woods, amber"
White Diamonds by Elizabeth Taylor: "Classic chypre, floral, warm and woody"
Bijoux Romantique: "Coconut, woody vanilla"
Like This: "Citrus, spice, immortelle"
You or Someone Like You: "Mint, rose, grasses"
Kay also gave a nod to several Yves Rocher fragrances, Comme Une Evidence Green, Vanille Noir, and Monoi Eau de Vahines, which she calls "the best beach skin-scent". I'm warning you off one I named in the first frugal frags post: Sarah Jessica Parker Lovely. A drop in quality (to which commenter hummingbird5 alluded) happened each time distributors changed after the original, Coty Prestige—but the precipitous plunge came when the most recent, Lovely Distribution Inc., stepped in. You can see the difference; note the pinker juice in the the Lancaster bottle. 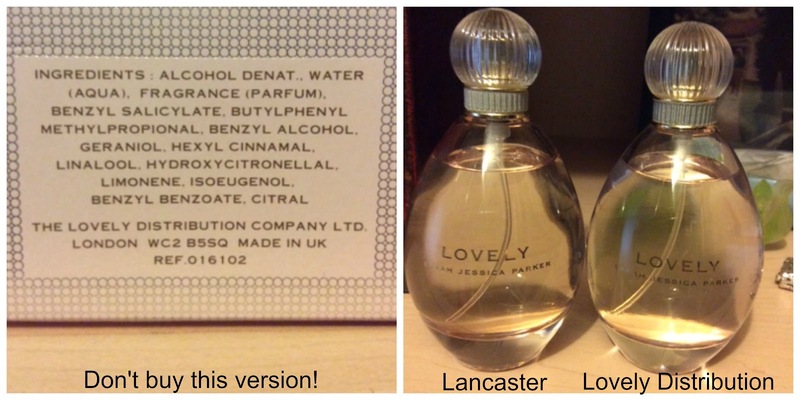 Lancaster was the second distributor, and a step down from the original Coty product. The greyish juice sold by the current distributor (bottle at far right, Lovely Distribution), has been described by furious customers as "a total absence of any scent but alcohol." An e-mail exchange with a well-known online vendor confirmed what I thought. He would not quite call the LD product a travesty but said "certainly the Lancaster version is better." The silver lining in the Lovely cloud is that I resolved to find other frugal buys; warm thanks to Kay for sharing her expertise with us. Well...I tried Lovely earlier this year and didn't like it. Thought it was just me but I guess not. What a shame for those who loved this fragrance. Speaking of unlimited budget, Perfumes the Guide: 2018 (Turin and Sanchez) mentions several scents priced into the hundreds of pounds. Their comments about these prices are pretty cutting. Thanks to you and perfume niche for keeping it real. I'll jump in...not sure if you consider this frugal but several of the Gorilla fragrances sold via Lush shops are very nice. They offer two bottle sizes, the smaller is under $50 I believe. Unfortunately or not, this afternoon I tried Narciso E de P and love it. Didn't check the price but I bet it's not very frugal. Long lasting though so that's a consideration. I just happen to have a gift card to the Bay kicking around....hmmmm. Laura H: I just bought a 30 ml bottle of Gorilla “ Breath of God” for $ 50; at only 30 ml. not so frugal, but it is so potent a half- sray will do, so it’s not bad. An extremely polarizing scent. Narcisco for Her is a gorgeous, luminous modern floral, I have it and the family love it. It is “ lady” , ( in the best sense) quite my personality but people always say, “mmmm; you smell divine”. It is somewhat overexposed, which some women care about, others not at all. But for a reason...a modern classic, the best of that genre. Test the edp and edt, they are different and each has fans. I wear Narcisso for Her, both EDP and EDT. It is strangely, barely there on me though and no one ever comments on it. Lovely is considered a dupe for For Her. I tried it the other day and it is indeed very similar. Unknown: Narcisco for Her is often cited as the “ inspiration” for Lovely and according to some perfume blogs, SJP acknowledged that. To my nose, they develop differently and I would not confuse them. Narcisco in both edp and edt is richer, more complex. ( I used the few remaining drops of my Coty bottle of Lovely assess.) The Lovely Distribution iteration is so indistinct that a comparison is pointless. It might just not project well on you. You might email Gwen and Kay with what you like, or are looking for, and they can suggest some decants. I do not know what I will do when my old bottle of Ombre Rose by Jean Charles Brosseau is gone. I have had it forever and it has never “turned”. I have come to learn I love scents with Amber, Neroli and a little musk. There used to be a drug-store brand called Healing Garden and they had a line of bedtime products called ZZZZZ (I forget how many “Zs” were in the name). I believe it was a division of Coty and is now gone. It was mostly neroli oil and vanilla and was gorgeous. There was a spray, a room and linens spray, as well as a delicious lotion. I miss it so much. There was another drug-store cologne I loved called Skin. That too is gone. It had a wonderfully fresh, soap and water scent with just a little hint of intrigue. My back-up go-to of Jean Nate just is not what I remember. I guess some day I will return to Shalimar.